My college roommate moved to D.C. at the end of last summer, and while I didn’t envy her at all during the winter, the pictures she’s been posting lately of the Japanese cherry blossoms have certainly kindled a longing to revisit the capital. Though I probably won’t make it up there this spring, I put together the next best thing, thanks to Millennial Central and Kirin beer (who coincidentally is the sponsor of the National Cherry Blossom Festival)—that next best thing being a night of Japanese food and drink. Now ya’ll I know I’m a big fan of both beer and travel, and one of my favorite things to do when I get to a new country is order a pint, can, bottle, or bucket of the local specialty. Needless to say, I was really looking forward to trying both Kirin Ichiban and Kirin Light. So how to round out the menu and make a meal out of it? Luckily Kirin has partnered with celebrity chef, Candice Kumai (of Top Chef fame) to share recipes and pairing recommendations. While I got a few of Candice’s favorites in a little booklet, if you follow Kirin’s Facebook page, you’ll receive a continuous stream of special recipes that go well with the beer. (I highly recommend you do so—the recipes I got were positively drool-worthy!) But first, the beer. Kirin Ichiban is a full-bodied, malty beer with a smooth flavor and clean finish. Kirin is one of Japan’s oldest breweries, and the homebrewers among our little group were fascinated by the first-press brewing process. (If you click the link there’s a hypnotic animated gif showing demonstrating how it works). My boyfriend really liked the bold, clean taste the Ichiban, which perfectly complemented our gyoza and avocado rolls. Let me preface this with the fact that I am normally not a light beer drinker. Most light beers I’ve had have been really watery, tasteless concoctions that aren’t worth the 65+ calories you’re saving by drinking them. The same cannot be said of Kirin Light. It surprised me by being my favorite of the two—incredibly refreshing, easy to drink, and a welcome relief from the spice and bold flavors of the dishes in our food spread. I can easily see it becoming a cookout or poolside favorite when the weather gets hot. What did we drink it with? 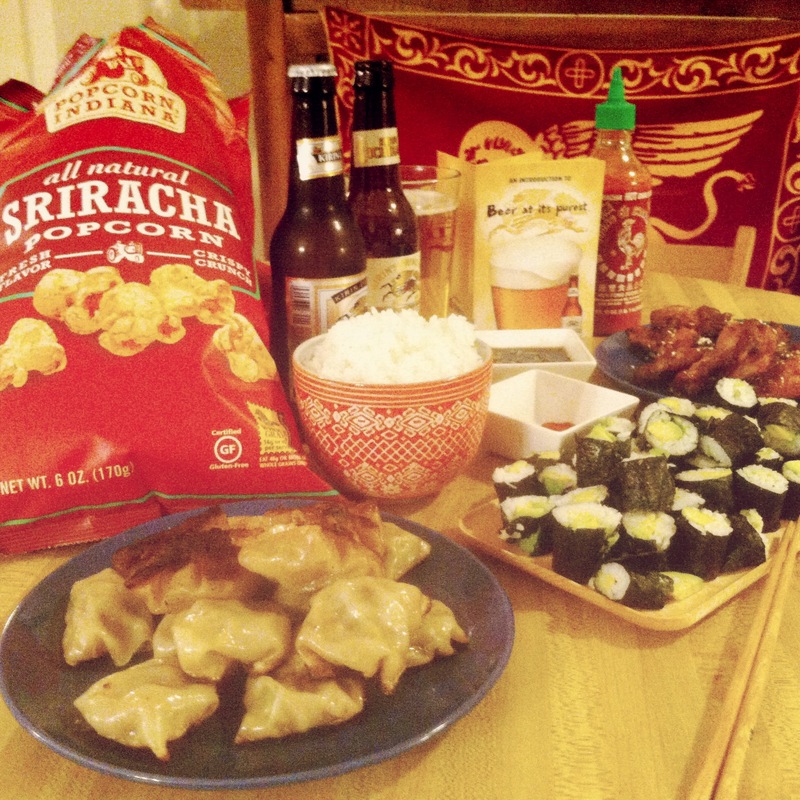 Gyoza: As you can see in the pics below, we ended up with quite a spread. We started with Candice’s recipe, “Mom’s Homemade Gyoza.” I have a HUGE weak spot for gyoza, and making it from scratch was kind of a dream come true. The flavors blended together perfectly, and Candice’s method of “freaming” (half frying, half steaming), left them gyoza mouthwateringly soft on top and nice and crispy on the bottom. They literally flew off the plate. Avocado Rolls: Candice also provided a recipe for Maki Sushi Rolls, which I’m sure are delicious. I can’t eat fish though, so my poor dinner party was deprived of that certain goodness. Instead, we compromised and made avocado rolls—all of us newbies at the sushi rolling technique. Once we did our first roll, we were addicted…as our mountain of cut sushi can attest! 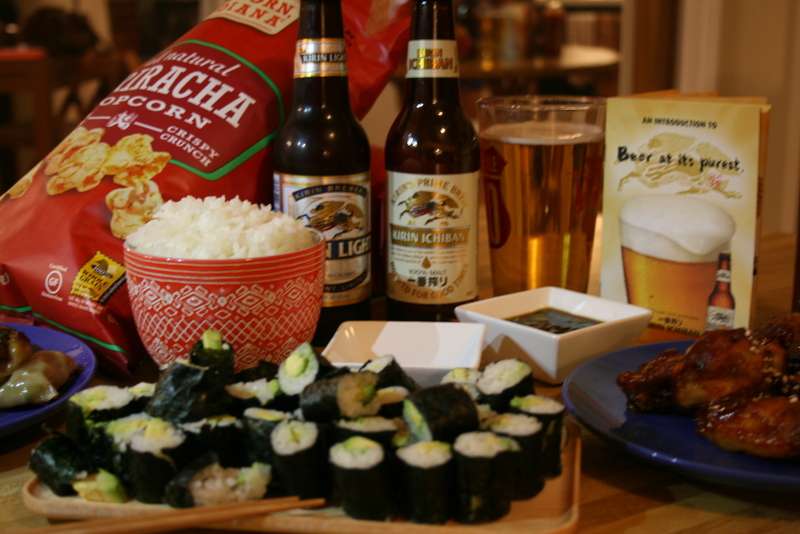 The salty flavor of the nori wrapper, the tartness of the rice and vinegar, and the buttery smoothness of the avocado were a perfect match for the malty flavor of the Kirin Ichiban. Sriracha: Our dinner party guests are big siracha fans, and since the beer is so light and refreshing, I thought it would pair well with the fiery kick of the Asian chile sauce. (Man, was I right). Our guests brought over a bag of siracha popcorn to tide us over while we finished cooking. Siracha popcorn + beer = addictive! As a special treat, I tried out a recipe for honey siracha wings that I found on The Comfort of Cooking. WOW. They were another overwhelming hit with the party, especially when followed up with a sip of Kirin Light. Before we set into the meal, we toasted each other and the season with the traditional toast: “Kanpai!” which literally mean, “dry your glass.” Easy to do with a beer like Kirin, that’s for sure!